The Illinois Arts Council has awarded Kartemquin filmmaker Dinesh Sabu a grant of $2500 for Individual Artist's Support, to use on his debut documentary Unbroken Glass. Dinesh, a graduate of the Kartemquin Internship program, will use the funding to consult with Kartemquin's Senior Editor Leslie Simmer (editor on As Goes Janesville, In the Family, The War Tapes and more) this winter to integrate some of the more complex social issues Unbroken Glass tackles into the film's narrative. 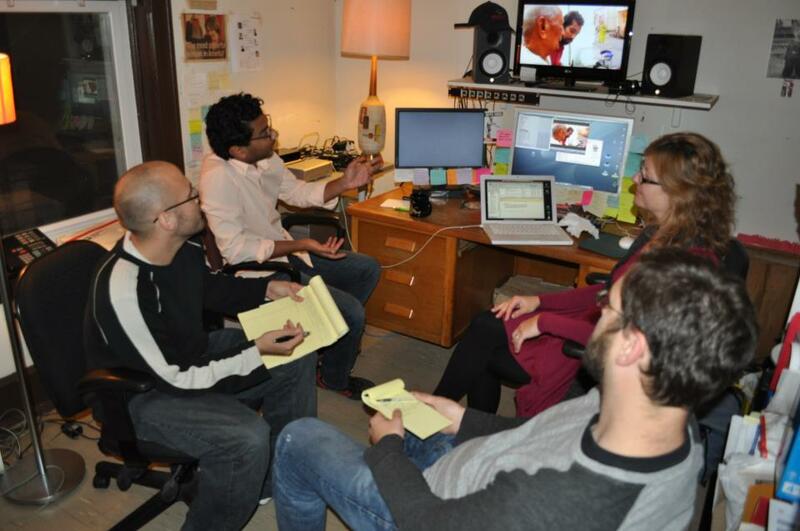 "IAC aims to cultivate artists in Illinois, and I think they must have recognized how much my editor Matt Lauterbach and I will benefit from working with an award-winning editor like Leslie," said Dinesh. "Her experience working on In the Family in particular - also a personal, social-issue documentary - makes her expertly qualified to mentor us as filmmakers on Unbroken Glass. She's also just a wonderful person." Unbroken Glass focuses on mental illness in the South Asian community through the story of the filmmakers' parents, who both passed away when he was 6. We hope to have the film complete for 2014. You can follow production on Unbroken Glass on Facebook and donate to the film yourself. Photo: (l-r) Unbroken Glass producer Patrick Lile, director Dinesh Sabu, Leslie Simmer and editor Matt Lauterbach at Kartemquin Films.